Two things will determine you final purchase price: shipping and cost of products. 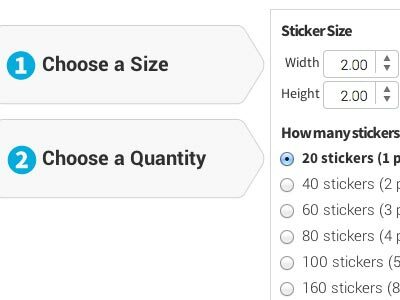 At StickerYou, we charge per sheet of material than per sticker. Therefore, the cost of order is dictated by the dimension , material and quantity of stickers you need. Volume pricing applies to all orders so as your quantity or stickers increase, so will your savings! Keep in mind that the shipping cost covers not just the cost of getting your order to you, but it also dictates the speed of service (how quickly it prints). Thus, if your order is time sensitive (need it by a certain time) or you need it as soon as possible, we highly recommend choosing the Express or Rush shipping options for faster and trackable packages. Our stickers and labels are priced per sheet and sticker sheet pricing depends on two things: the material, and the sheet quantity. Volume discount automatically applies on all orders and vary from on material to another. For a quote, you can visit our Quick Quote Calculator. For a full breakdown of our prices, please visit our Volume Pricing Page.